Yesterday I described my impressions of Lightroom Mobile. Today I’d like to share my Lightroom Mobile workflow. There are two methods I use to transfer photos from my Nikon DSLR to an iOS device. I own the original camera connection kit which came out at the same time as the first generation iPad. This kit, which includes USB and SD Card adapters, remains compatible in the world of Lightning ports via a 30 Pin to Lightning adapter cable. I now keep both the adapters and the cable in my camera bag, and they are so small they take up almost no storage space. The only downside of the older kit is I’m limited to USB 2 speeds on my 12.9 inch iPad Pro. The newer kit transfers data as USB 3 speeds, which can be a significant time savings after a large shoot! Third party adapters can be found on sites like Amazon for relatively cheap, but I’m a bit leery of their reliability. Your mileage may vary, and many of the third party adapters offer multiple connection options. If you don’t already own a camera connection tool, they may be worth exploring. Just shy of a year ago I purchased a portable wireless router and flashed it with a firmware which allowed me to wirelessly tether my camera an iOS or Android device. QdslrDashboard is a fantastic tool, and the cost of the hardware and associated app are far less than the far better known CamRanger. Actually the hardware appears to be identical, though CamRanger’s software is a bit more polished 1. As with most wireless tethering systems, QdslrDashboard allows a user to transfer images, even RAW photos, from the camera to the viewing device. I typically use this setup whenever I want to do exposure stacking 2 or in situations where either long exposures are required or camera shake would become an issue. Wireless transfer can take some patience, but being able to view and adjust photos while I’m on location has come in very handy 3. 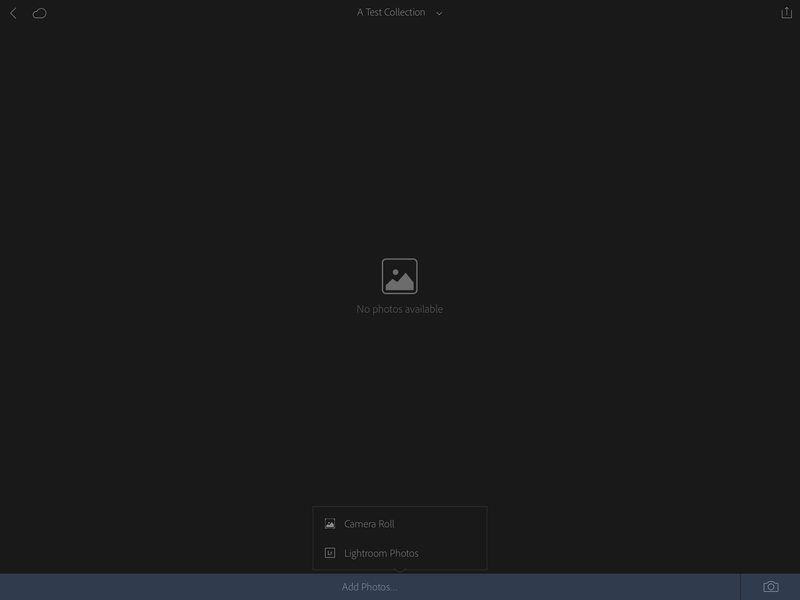 I currently have Lightroom Mobile set to “Auto Add Photos” from my camera roll. This is convenient, as every photo I take with my phone is automatically backed up to my Lightroom library, but I’m considering turning it off. First, I don’t necessarily need every photo which appears in my camera roll to be transferred into my Lightroom library 4. Second, it means transferring photos twice — once into Lightroom Mobile and a second time to a collection in which I store the images from a particular shoot. Wether this option is on or off, however, the general process remains the same. First, open up Lightroom Mobile 5 and in the “Organize” view tap the plus icon in the upper right to create a new collection. This creates a new, empty, collection into which photos may be added. Second, tap the “Add Photos” button and select either “Camera Roll” or “Lightroom Photos,” depending on the status of “Auto Add” in the app 6. Select the photos you which to add, and tap the “Add [number] Photos” button at the bottom of the screen. This will import the photos into the collection, which will automatically be synced with Lightroom the next time the device device is connected to the Internet over wifi. Once the photos are imported they can be edited using Adobe’s amazing adjustment tools. Actually touching a photo to edit it is an experience which I highly recommend for any photographer! 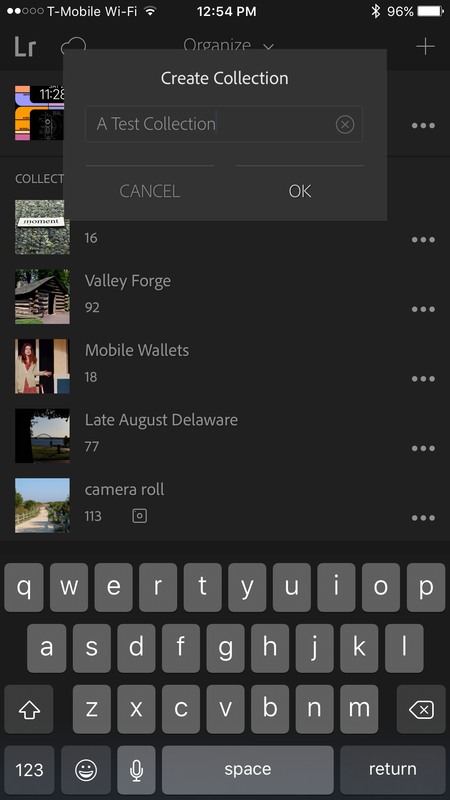 Photos which are imported from Lightroom Mobile will show up in the collection created inside the mobile app. This can take some time, depending on connection speed, but is not agonizingly slow. Given the nature of how Lightroom handles the library, however, users need to be aware collections are not indicative of where photos are actually stored on the hard disk. Lightroom enables users to organize their photos in both library-controlled collections and filesystem-created folders. When a photo is imported into a Lightroom library via Lightroom Mobile a directory, named “Lightroom Mobile,” is created on the same drive on which the Lightroom library resides 7 Photos can, of course, remain in this folder, and even manually organized into sub-folders if a user desires, but I tend to pull images into sub-folders under my main Lightroom directory. At any rate, moving an image from one folder to another inside Lightroom 8 doesn’t affect it’s availability inside collections. This two-tier organization can be confusing for users at the start, and many simply choose to favor one method over the other, but I’ve come to value both in my workflow 9. At this point I then return to my mobile device and delete the imported RAW files from my camera roll. I could probably do this step immediately after the photos are added to Lightroom Mobile, but photos are precious and I like to be certain I don’t lose anything! As I mentioned yesterday, one shortcoming in Lightroom Mobile is the inability to add meta data — such as tags, descriptions, and image titles — to imported photos. Because of this, my final step after syncing a collection into my main Lightroom library is to add this data. With this workflow I can accomplish about 80% of my photo organization and editing with my DSLR photos without ever having to touch my MacBook Pro. If you’d like to edit your photos on the road, it’s certainly worth exploring. Next Hey look, a Portfolio!